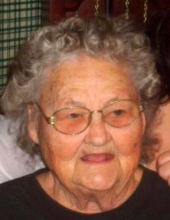 Evelyn M. (Shaffer) Groves, age 91 of Charleston, IL, formerly of Borton, passed away on Saturday, February 2, 2019. Evelyn was born December 15, 1927 in Borton, IL to Bruce E. and Edna Viola (McGregor) Shaffer. She married Robert H. Groves on March 14, 1946 in Paris, IL. He preceded her in death. Evelyn enjoyed camping and gardening, and spending time with her family. Evelyn was preceded in death by her parents, her husband, an infant son, three brothers, and one sister. She is survived by two children: Danny (Elaine) Groves of Borton, IL and Ron (Marilyn) Groves of Charleston, IL: one brother: Leland (Beverly) Shaffer of Brocton, IL; eight grandchildren, and several great-grandchildren. A graveside funeral will be held Thursday, February 7, 2019 at 11:00 a.m. at Embarrass Cemetery. To send flowers or a remembrance gift to the family of Evelyn Groves, please visit our Tribute Store. "Email Address" would like to share the life celebration of Evelyn Groves. Click on the "link" to go to share a favorite memory or leave a condolence message for the family.